Hello all. With a few weeks left until the end of year examinations, you will find a bank of revision resources here that will help you to prepare for the big one! Do You Know Your Exam Level & Target Grade? By now, you will know if you have been entered for the Foundation (F) or the Higher (H) paper. Both papers test the same subject material but the questions are structured in a slightly different way. This paper is light yellow in colour (sorry, hasn't come out that well here). It is marked out of 99 and you have 1 hour 45 minutes to complete it. Top mark possible is a GCSE Grade C. Check out the code on the top right hand side. You need to double check this on the day. Make sure that yours says 'F'. This paper is white in colour unlike the foundation paper. It is marked out of 99 and you have 1 hour 45 minutes to complete it. Top mark possible is an A*. Scores below D grade get a 'U' grade. Check out the code on the top right hand side. You need to double check this on the day. The Higher Paper (H) contains THREE questions that require a higher level of extended writing and application of case studies throughout. 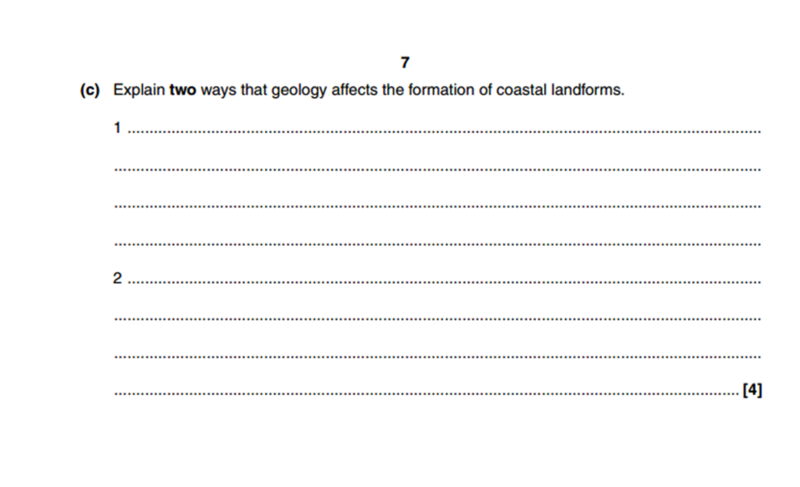 See 'Coasts' example question beneath. Both the Foundation & Higher papers will be accompanied by exactly the same Resource Booklet. This can be up to 10 pages long and will include graphs, photos, charts, maps and quotes that will relate to questions in the exam paper. Where you need to refer to the Resource Booklet, it will clearly tell you in the exam by stating a figure number e.g. 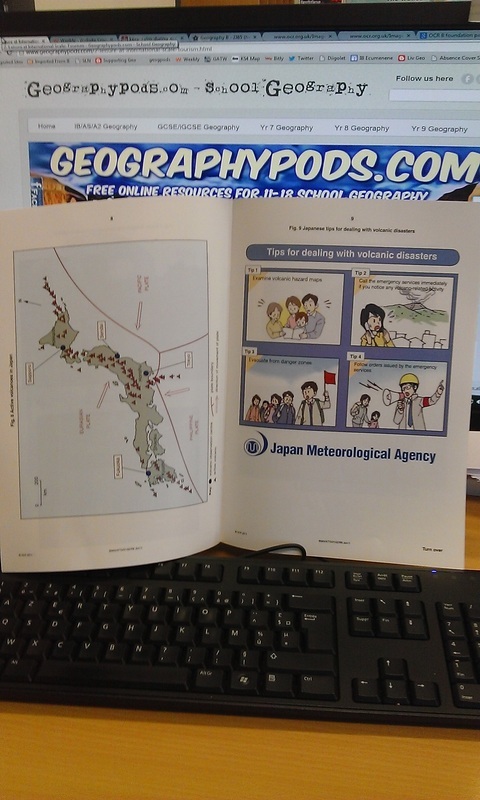 "Study Fig 4, a map showing plate boundaries near Japan". WARNING - Read The Small Print! From 2014 onward, there are now marks available for spelling and grammar. Check the instructions above to see where those marks are in the paper. Look of the pencil mark. Here are the specimen 2014 papers for Foundation & Higher Geography qualification. Rivers & Coasts will be tested but in your SDME. You can use the materials further down on this page to help you with that exam. Check your knowledge of the issues covered using the excellent spreadsheet created by Mr Matthews. Click on the tab to the right. WANT TO BUILD YOUR CASE STUDIES?? - Click here for a tool. Revision, Revision, Revision. Where To Start? 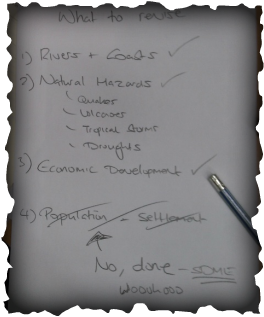 This is the wonderful screencast produced by Mr Berry for the 2014 paper The three themes under examination that year were Rivers & Coasts, Population & Settlement and Economic Development. This year the SDME covers Rivers & Coasts. **Note, the structure of the exam and number of marks for each question has changed since 2013** - Consult your teacher to find out what the changes are. This theme wil be tested in the SDME examination on 24th May 2016. You need to focus your revision around this type of examination and not the key theme format. Click here for an excellent revision & case study list for the Rivers & Coasts unit. This was completed by Mr Briggs but remember that not all schools do exactly the same case studies. This is a great starting point though. The most likely scenario here is that you will have a mixture of both rivers and coasts questions in this section. Be prepared for all eventualities. Don't forget you can have constructive & destructive waves. As the wave moves up the beach, it is called swash. As it rolls back down the beach, the movement is called backwash. Watch Mr Rogers video to the right for a really great example. Make sure that you can describe how one feature can lead on to another e.g. "The sea exploits a weakness in the cliff face, where less resistant rock lies, and begins to open it up by the processes of hydraulic action and attrition. This is a faster process on exposed coastline and the weakness is eventually opened up into a cave ...... etc"
Making links between erosional processes and the landforms is really important. You need to know your stuff. Material is moved along the beach by a process called Longshore drift. Waves hit the beach (swash) at a right angles, driven by the prevailing wind. The backwash runs straight down the beach dragging beach material with it. Again, watch the excellent Mr Rogers video above to the right. Check this BBC animation to make sure you understand what's going on. 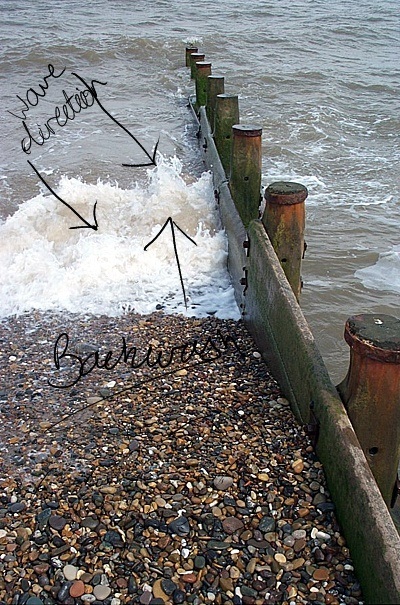 Draw a 60 second diagram to show how longshore drift occurs along the beach. Don't forget to name and add key processes annotations to the diagram. Study the diagram to the right and watch the West Wales Spits video to the right. Q. How does the process of Longshore Drift lead to Spit formation? Use a diagram to help you to explain. Q. Explain what happens to the area behind the spit and the original shoreline. Q. Would a spit ever traverse and block a tidal estuary completely? Find your case study example of a spit and read up carefully about its location and main features. A great example is Spurn Head. Do a Google search for more information. 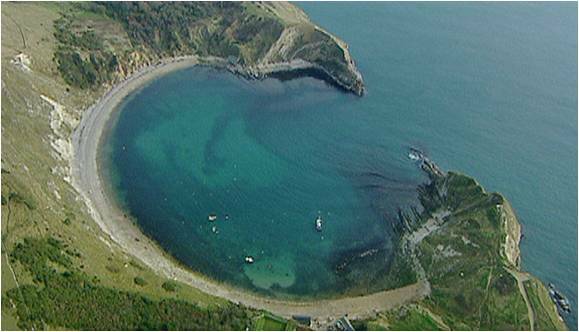 Make a sketch of Lulworth Cove, above. Annotate five features and processes that have led to its formation. Study the information to the right hand side. 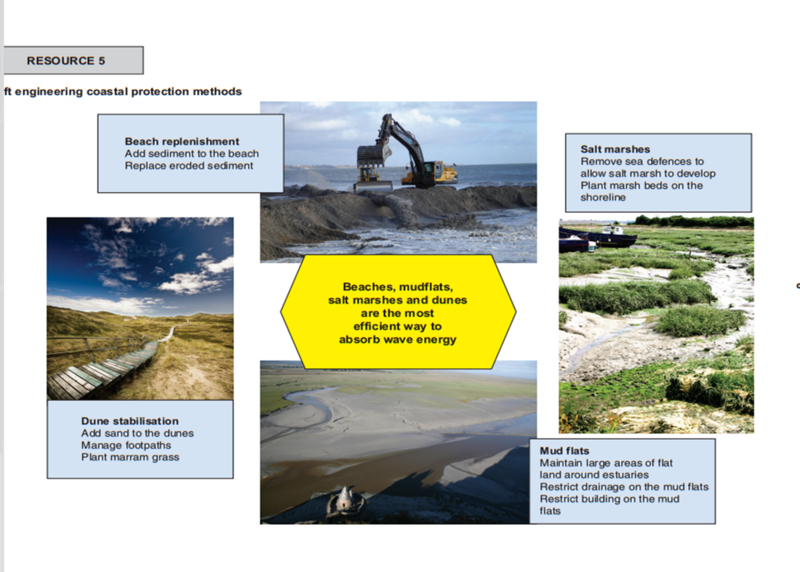 This is taken from the June 2011 OCR SDME on coastal protection. 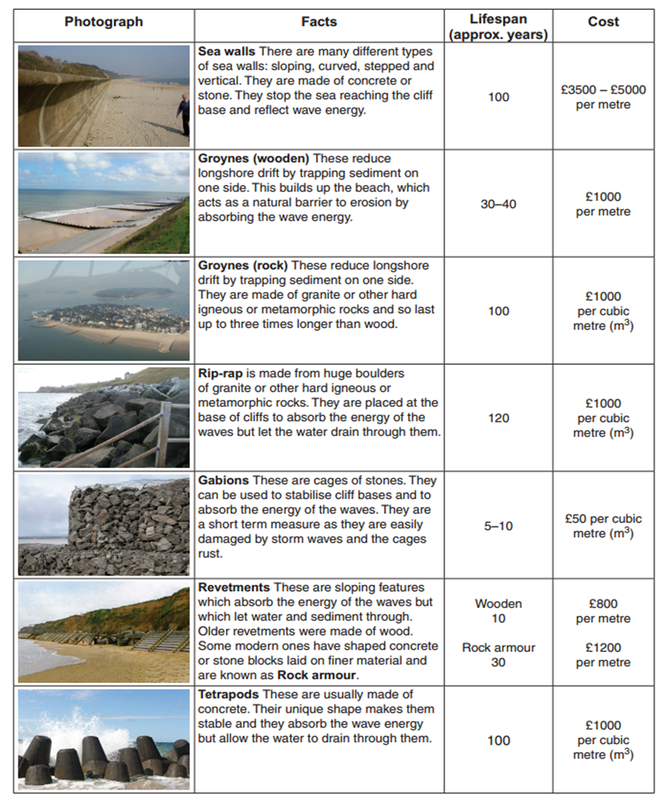 It gives you some great information on the different types of sea defences, their approximate lifespan (how long they will last for) and the cost. These methods are classed as HARD ENGINEERING. Don't forget that a cost-benefit analysis is always required before deciding on whether to protect a stretch of coastline. If the land behind it is expensive (i.e. expensive property, business, industry, communications etc), then money will be spent accordingly. 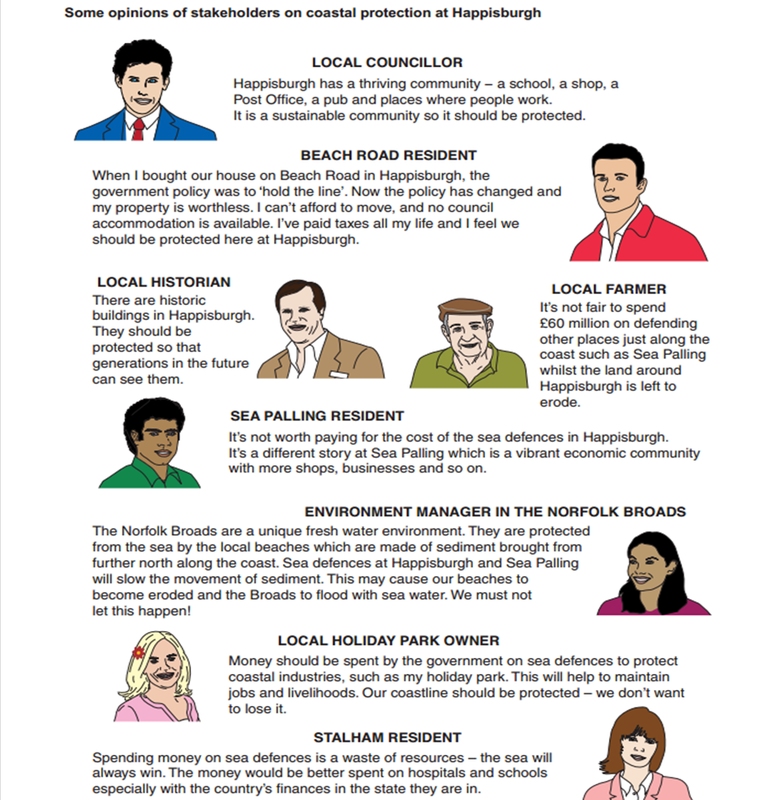 You wouldn't build a 50 metre stretch of sea wall costing £250,000 to protect a house worth £100,000. STOP CHECK: Can you identify how each type of protection actually works? Which ones stop erosion? Which stop transportation (LSD)? SOFT ENGINEERING can also take place. There are a number of ways shown in the two images beneath. 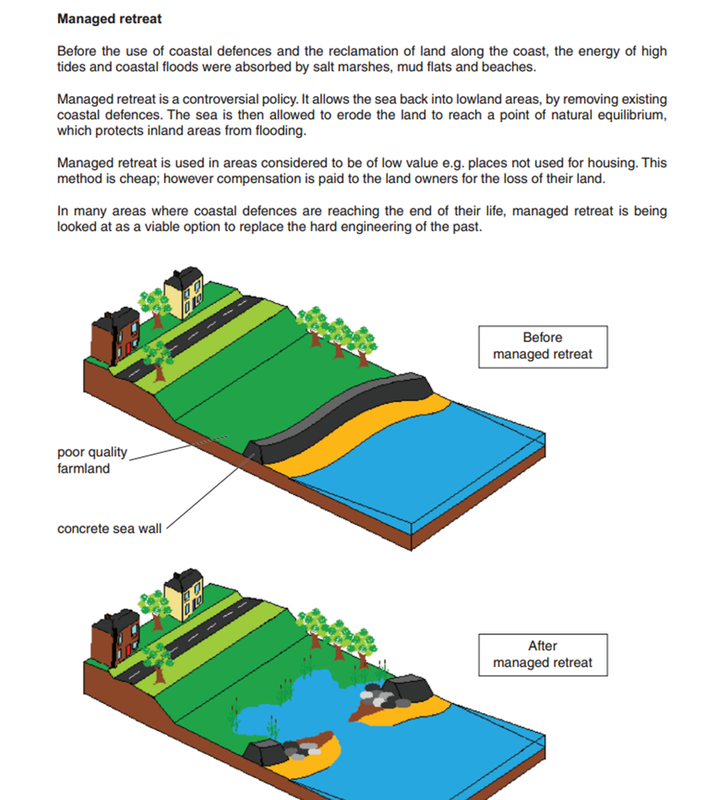 Who does coastal erosion concern? 20 minute timed examination question. After watching the Podcast and videos above, have a go at the following BBC Bitesize tests. At this point, together with the work you have done in school, you should be fairly confident. 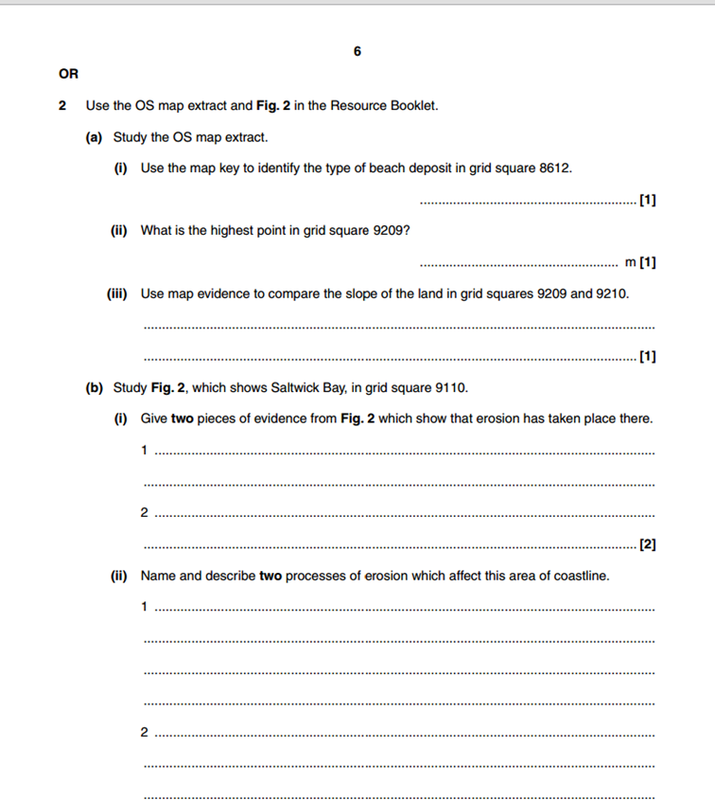 Below is the link to previous OCR B questions on Coasts and the resource booklet that goes with them. Use your geographical skills, case study understanding and theory knowledge to answer them. Open either the June 2011 Higher or Foundation Paper Below and scroll to page 6-8. Open the June 2011 Resource Booklet and scroll to page 3. Complete question 2 - worth 25 marks. Target time is 30 minutes. Features of a river - PDF Explanation & case study sheet using the River Tees, England. A good starting point is to watch the first 19 minutes of the first video to the right. This is the same series as the coasts video and presented by Elliot Brown. During the video, you will see all the main features and processes in the rivers unit of work. Source: The start of the river, normally found in mountainous areas. Mouth: The end of the river, this is normally where a river enters the sea, but it can be where it enters a lake. Confluence: Where two rivers join/meet. Estuary: The section of the river near the mouth that is tidal. 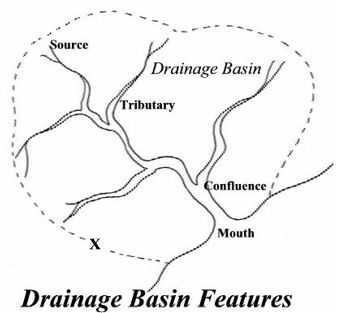 Drainage basin (catchment area): The area of land that drains into one river and its tributaries. A drainage basin is known as an open system because water can be added and lost. Watershed: The dividing line between two drainage basins. Erosion: the process of wearing something away. The river erodes in four main ways; attrition, corrosion, corrasion and hydraulic action. Corrasion (abrasion): The process of a rivers' load crashing and rubbing into a rivers' banks and bed causing pieces to break off. Corrosion (solution): The process of water dissolving a rivers' load as well as its bed and banks. 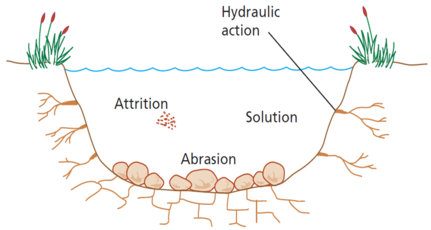 Hydraulic action: Water and air getting into cracks in a rivers banks and bed causing erosion through increased pressure. Attrition: Load crashing into each other in a river. This normally happens with suspended load. Remember in the upper course near the source there is more vertical erosionand in the lower course near the mouth, there is more horizontal (lateral) erosion. This is because near the source a rivers' load is bigger and more angular and therefore less likely to be suspended in a rivers flow. Instead it will bounce and crash into the bed, causing vertical erosion. However, nearer the mouth load is smaller and smoother and therefore more likely to be suspended and therefore more likely to crash in the banks, causing horizontal erosion. Because of erosion a rivers' load tends to get smaller and smoother as you move from the source to the mouth. River Long Profile: The long profile is the course the river takes from its source to its mouth. The long profile is often split into upper course and lower course (and sometimes middle course as well). The upper course is near the source and is normally found in mountainous areas. The lower course is near the mouth and on much flatter ground nearer sea level. Some rivers may have their mouth in lakes or wetland areas e.g. the Okovanga in Botswana, but this is unusual. Waterfall: Waterfalls are where water descends vertically. Waterfalls are usually created by a change in rock type. 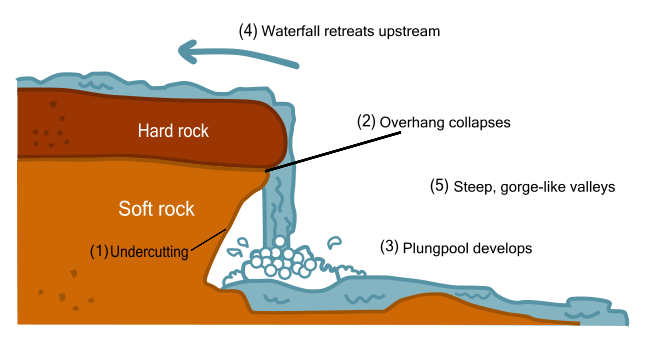 As the river moves from hard rock to soft rock, erosion increases creating a waterfall. As the water falls over the waterfall it erodes the river bed and the bottom of the waterfall. This makes a plunge pool and causes some undercutting. The undercutting creates an overhang which will eventually become too heavy to be supported and collapse into the plunge pool. The whole process then starts again, which means the waterfall is constantly retreating upstream towards the source. As the waterfall retreats it leaves behind a gorge. Gorge: A gorge is a deep sided valley left behind when a waterfall retreats. Rapids - Rapids are sections of rough turbulent (white water) water. They are normally in a river's upper course and are formed when you get layers of hard and soft rock. The layers of soft rock erode quicker than the layers of hard rock. This makes the bed of the river uneven creating rough turbulent water. Meanders: A meander is simply a bend in the river. If a river is very bendy it is said to be sinuous. A meander starts to form when the thalweg moves to one side of the river channel. This causes greater erosion on one side of the channel and deposition on the other. Over time the erosion and deposition will cause the river to bend. Meanders are constantly moving and over long periods of time widen the floodplain. 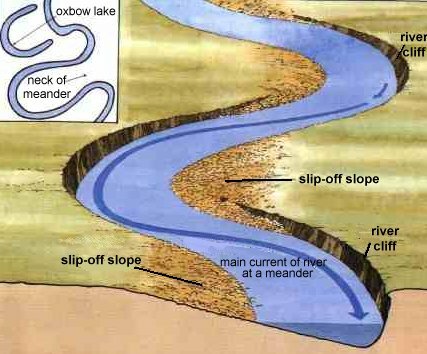 Slip-off slope (point bar): This is formed on the side of the river with greatest deposition (the inside of the meander). It is simply deposited material that forms a small beach like area and gently sloping bank. River cliff: This happens on the side of the river channel with greatest erosion (the outside of the meander). It creates a steep sided bank which often leads to undercutting of the bank. V-shaped valleys are found in a river's upper course where vertical erosion is dominant. The river will erode (cut) downwards while the sides are weathered (attacked by the weather e.g. rain, wind and the sun). The weathered material will then fall into the river and be transported away leaving a v-shaped valley. Interlocking spurs are the areas of the valley (hills) that stick out into the river forcing it to meander around them. Levees: Levees can be natural or man-made. They form on the edge of the river channel. When a river floods the velocity of the river travelling over the flooded floodplain suddenly falls. Because of the fall in velocity (and subsequent reduction in surplus energy) the river immediately deposits its largest load creating embankments that line the river channel. Over time (and after many flood events) these embankments begin to grow in size and become more stable. These are sometimes strengthened by humans or completely made by humans to try and reduce flooding. 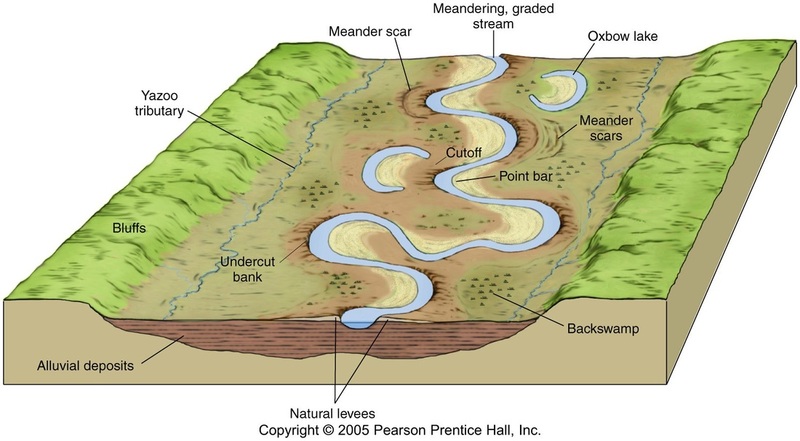 Oxbow lakes: Oxbow lakes are created when two meanders connect (join). 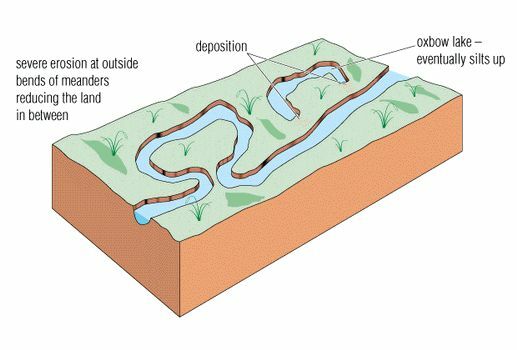 The river will often finally connect the two meanders during a flood event when the river is more powerful.The current then shifts to the centre of the river (and does not travel around the old meander) causing deposition on the outside of the river channel cutting off the old meander and creating an oxbow lake. 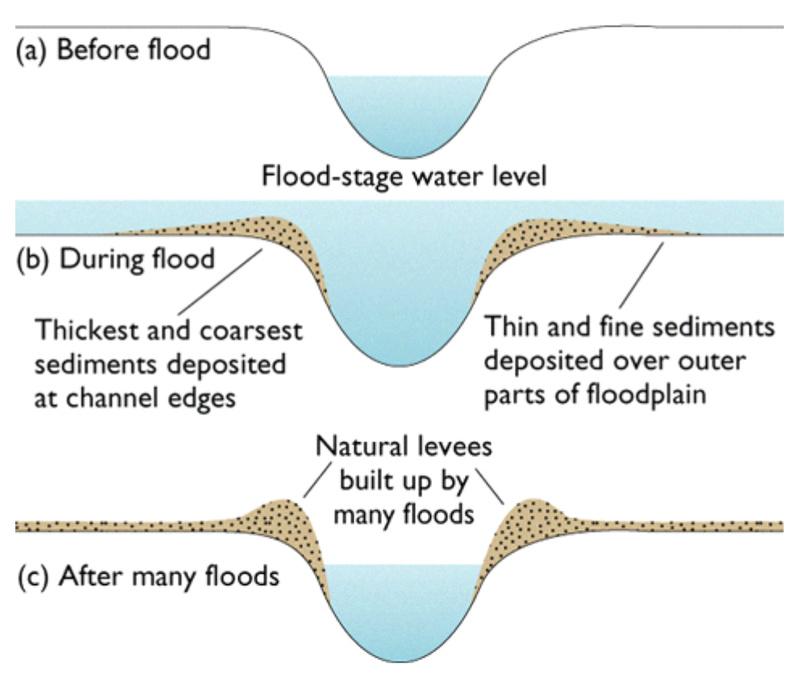 Floodplain: Floodplains are simply the areas of land that rivers flood onto when they exceed bankfull discharge. Floodplains are created by the constant movement of meanders. Because horizontal erosion is more dominant in a rivers lower course, floodplains tend to be a lot wider in a river's lower course. If you live on a floodplain you are at risk of being flooded. However, they also make great farmland because of alluvial deposits. A flood is a when a river exceeds its bankfull discharge and floods onto its floodplain. There are numerous techniques that are used to try and reduce flooding. The techniques can be roughly divided into hard and soft engineering. Hard engineering: This is building physical and permanent structures usually out of concrete and/or metal. Hard engineering solutions are usually more expensive, often ugly to look at, but can be very effective at preventing floods. 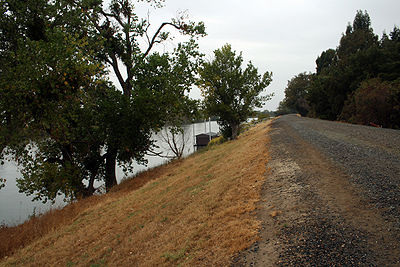 Levees are embankments built next to the river channel. 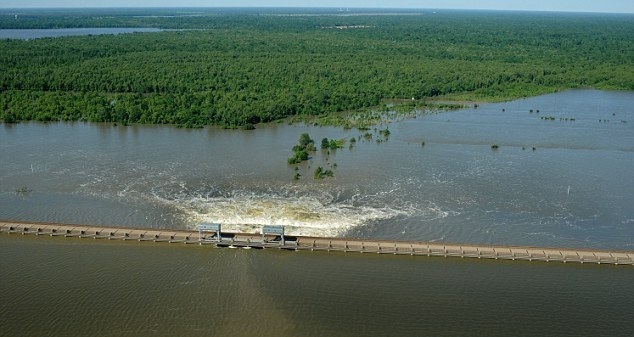 The simple idea of levees is to increase the cross-sectional area of the river channel. This means that the river channel is able to hold more water before reaching bankfull discharge and are therefore less likely to flood. Flood barriers are very expensive to build so therefore are only used to protect important urban areas. Flood barriers when closed form a physical barrier across the river channel. 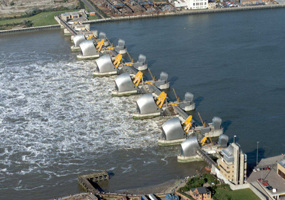 The flood barrier below is in London and is actually designed to stop storm surges flowing up the river from the sea. Flood control channels are concrete channels that normally contain no water. They may run above or below the surface and only get used when the normal river is about to reach bankfull discharge. 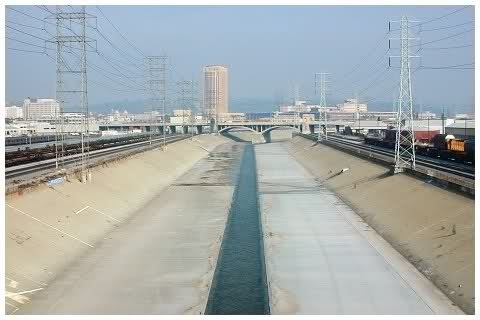 If a river is about to reach bankfull discharge then water will be diverted into the flood control channel. Dams are probably the most recognisable of all flood defences and one of the most expensive to build. 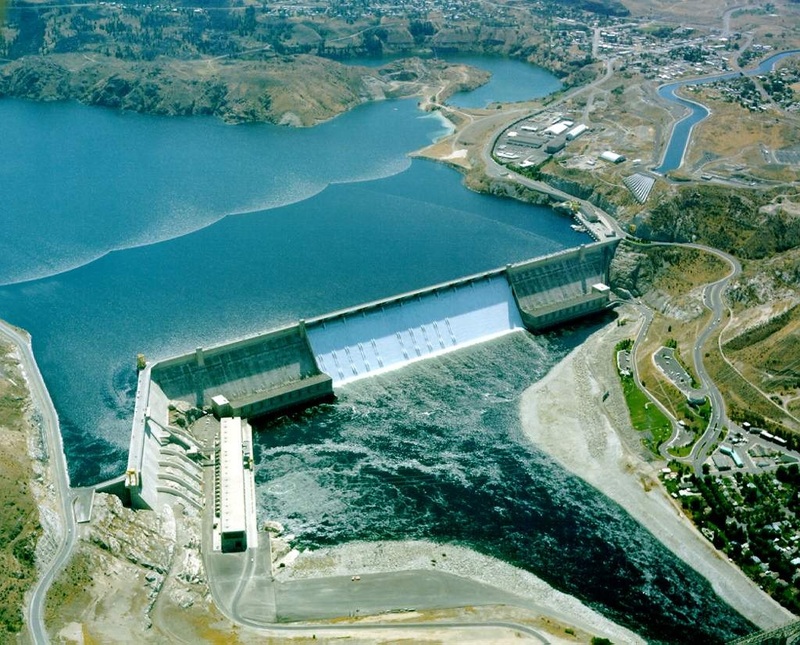 Dams often have multiple purposes, but one of those purposes is to regulate a river's flow so that the river never exceeds bankfull discharge. Soft engineering: This working with nature to reduce flooding. Soft engineering solutions can be cheaper and less visually intrusive. Reforestation or afforestation is simply planting trees. Trees can be planted anywhere in a river's floodplain. The purpose of planting trees is to try and increase the lag time (the period of time between peak rainfall and peak discharge) of a river. Trees increase the lag time by intercepting precipitation and slowing its movement to rivers. By slowing the movement of water to the river means it will experience smaller peaks in discharge. Controlled Flooding as the name suggests, it is allowing a river to flood. However, instead of letting the river flood anywhere a river is allowed to flood on land with low economic value. This means that area of farmland maybe allowed to be flooded in order to protect more important land uses like settlements and sites of industry. Boscastle is located in the county of Cornwall which is situated in the SW of the UK. Boscastle is a small village that only had 888 residents in 2001. A flash flood occurred on the Valency River in Boscastle on the 16th August 2004. The flood was extremely severe and was a 1 in 400 year event. Despite the devastating nature of the flood there was amazingly no deaths or serious injuries. This was largely due to the rescue efforts of 7 helicopters who airlifted 150 people to safety. However, about 100 cars, 5 caravans, 6 buildings and several boats were washed into the sea; approximately 100 homes and businesses were destroyed; trees were uprooted and debris was scattered over a large area. Boscastle was built in a narrow valley next to a river. Residents had never experienced a major flood event so were unprepared. Although Boscastle is only a small urban area, urbanisation can contribute to flooding. Urbanisation creates impermeable surfaces which stops infiltration and increases surface run-off into rivers. Bangladesh: Bangladesh is located in South Asia. On three sides it is surrounded by India and on the fourth is the Bay of Bengal. Bangladesh has a population of 156 million people, a population density of 1099 square kilometres and a GDP per capita of only $1900. 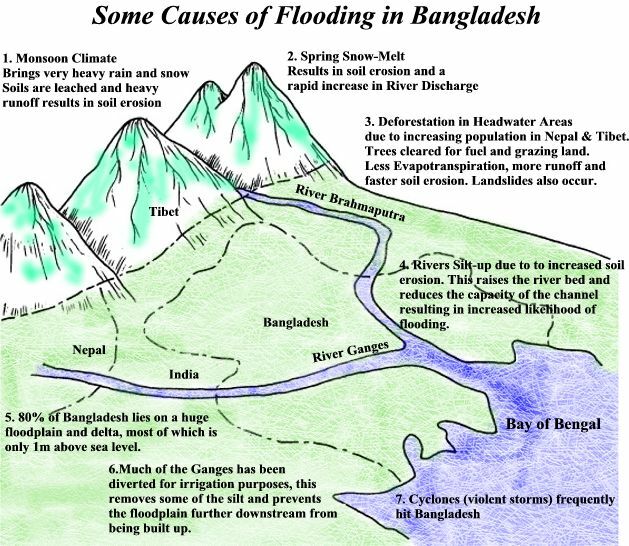 Global warming is causing more snow to melt in the Himalayas, it is causing sea levels to rise and it is increasing the frequency and magnitude of cyclones. Pollutants can be washed off the land. Below is the link to previous OCR B questions on tectonic hazards and the resource booklet that goes with them. Use your geographical skills, case study understanding and theory knowledge to answer them. Open either the June 2011 Higher or Foundation Paper Below and scroll to page 2-5. Open the June 2011 Resource Booklet and scroll to page 2. The map extract from the examination is not available online due to copyright restrictions, however you can find it by clicking on the last tab and zooming in to Whitby. Complete question 1 - worth 25 marks. Target time is 30 minutes. In the exam you should expect this section of the paper to contain questions on all of these hazards and so you should be prepared for them all, including your case studies. Click here for an excellent revision & case study list for the Natural Hazards unit. This was completed by Mr Briggs but remember that not all schools do exactly the same case studies. This is a great starting point though. 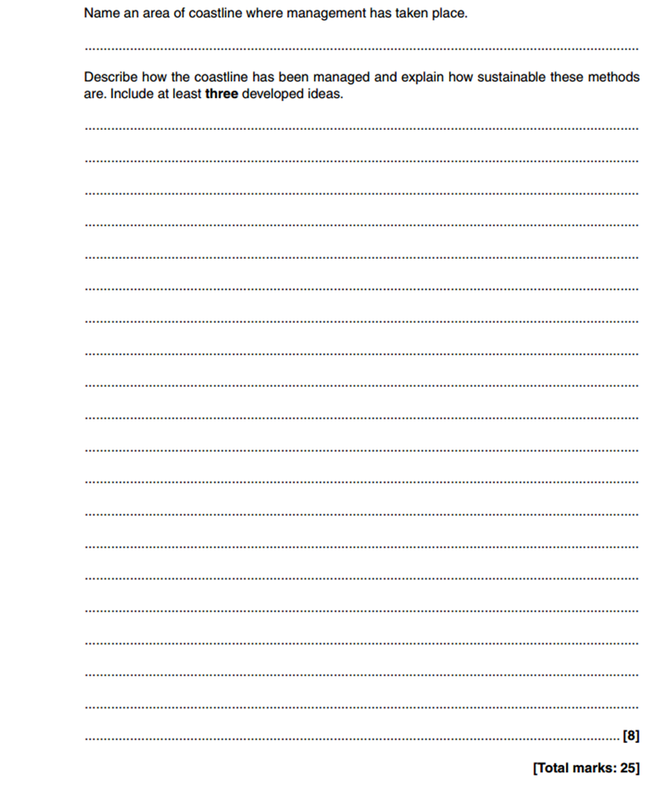 Click here for a revision sheet from Villiers school, UK. 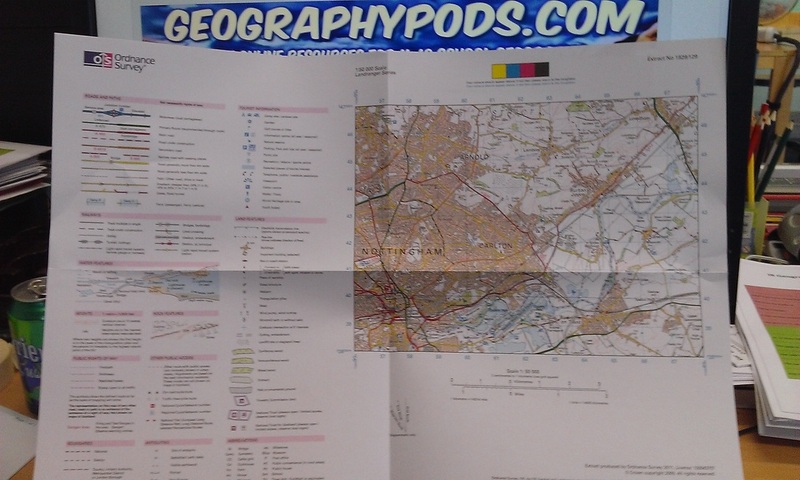 Click here for an A3 four page revision sheet created by geographypods for his students at the International School of Toulouse. CAUSES, SHORT TERM EFFECTS, LONG TERM EFFECTS, SHORT TERM RESPONSES, LONG TERM RESPONSES ... AND HOW THEY VARY BETWEEN COUNTRIES OF DIFFERENT LEVEL OF DEVELOPMENT. HOW CAN THE HAZARD BE MANAGED, PREDICTED OR EVEN PREVENTED? Open the June 2012 Paper Below and scroll to page 11-13. Open the June 2012 Resource Booklet and scroll to page 10-11. Complete question 4 - worth 25 marks. Target time is 30 minutes. So, as you know, this section will be on either Tropical Storms (also called Hurricanes in the Atlantic & Typhoons in the Indian Ocean) or droughts, or maybe a mixture of both. Be prepared. CAUSES, SHORT TERM EFFECTS, LONG TERM EFFECTS, SHORT TERM RESPONSES, LONG TERM RESPONSES ... AND HOW THEY VARY BETWEEN COUNTRIES OF DIFFERENT LEVEL OF DEVELOPMENT HOW CAN THE HAZARD BE MANAGED, PREDICTED OR EVEN PREVENTED? *Both from the orange OCR B textbook. You have a digital copy on your laptops. After watching the Podcast above, click here to take the brief BBC Bitesize test. Above (as per last exam practice) is the link to previous OCR B questions on climatic hazards and the resource booklet that goes with them. Use your geographical skills, case study understanding and theory knowledge to answer them. Open either the Higher or Foundation June 2012 Paper Below and scroll to page 8-10. Open the June 2012 Resource Booklet (same for both Higher & Foundation) and scroll to page 8-9. Complete question 3 - worth 25 marks. Target time is 30 minutes. Economic Development & Pollution - Pearl Delta, China. Click here for an excellent revision & case study list for the Economic Development unit. This was completed by Mr Briggs but remember that not all schools do exactly the same case studies. This is a thorough and detailed starting point though. Below is the link to previous OCR B questions on Development & Aid and the resource booklet that goes with them. Use your geographical skills, case study understanding and theory knowledge to answer them. Open either the Higher or Foundation June 2012 Paper Below and scroll to page 14-16. Open the June 2012 Resource Booklet (same for both Higher & Foundation) and scroll to page 12-13. Complete question 5 - worth 25 marks. Target time is 30 minutes. Above (as per last practice exam) is the link to previous OCR B questions on Industry & Trade and the resource booklet that goes with them. Use your geographical skills, case study understanding and theory knowledge to answer them. Open the June 2012 Paper Below and scroll to page 17-19. Open the June 2012 Resource Booklet and scroll to page 14-16. Complete question 6 - worth 25 marks. Target time is 30 minutes. 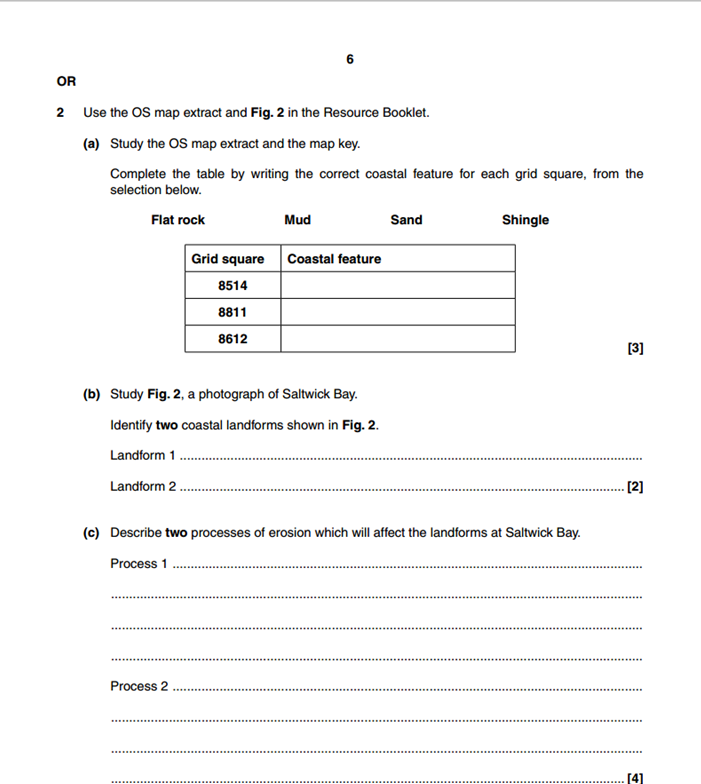 One of the questions in the May 2014 exam will require you to use some OS map skills to answer the question. 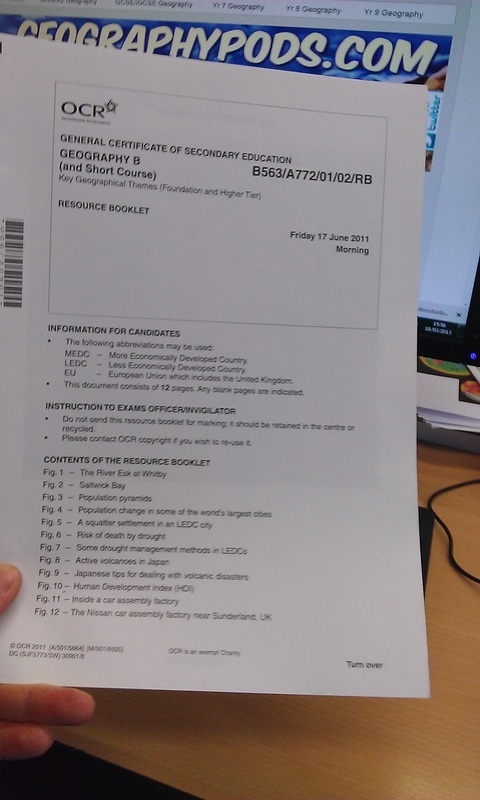 The map extract will look like this one and be separate to your exam paper and resource booklet. There are plenty of sources of information out there like here, page 8-10 that explain key skills. Or why not study the presentation below that gives you more than enough information. Here is the website that goes with it. That's all folks. Revise well and be focused. Keep away from Red Bull, Coke and rubbish food in the lead up to the exam period. It doesn't do you any good. Get some sleep too. Staying up all night cramming revision is a bad way to do it. Plenty of discussion here on studentroom.co.uk where you can swap and share ideas. Be great! !